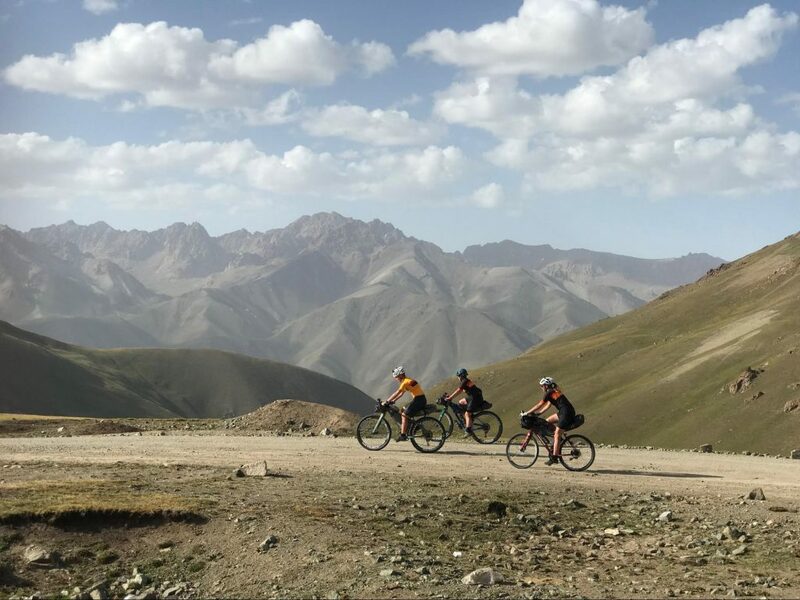 The Silk Road Mountain Race launched in the summer of 2018 and is one of the toughest ultra-distance cycling events on the map. 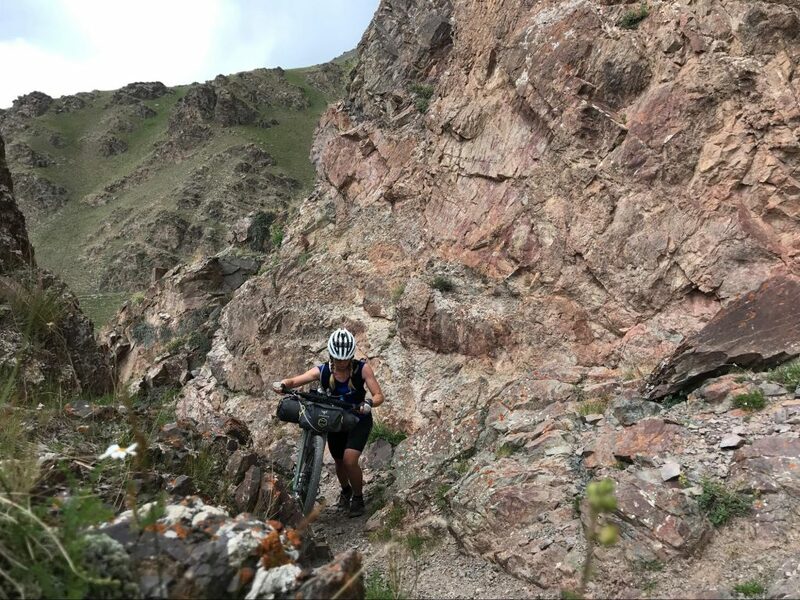 Riders follow a fixed route and complete the single stage race through the mountains of Kyrgyzstan completely unsupported. The clock does not stop and there are no prizes. Riders take this challenge on purely for personal reasons – leaving ego at the start line. The route follows gravel, single and double track and old Soviet roads that have long been forgotten and fallen into disrepair. There is very little tarmac, quite some walking, and at times the distances between resupply points are so great that survival becomes a critical topic. In the first edition, held in 2018 only a third of the riders actually completed the event. “I have scratched from the Silk Road Mountain Race. 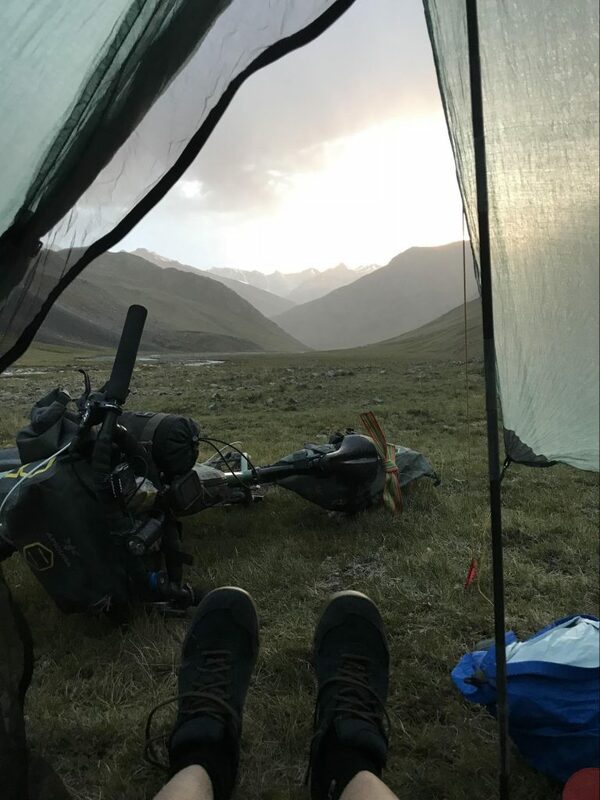 I’m at checkpoint two, four days into this 1700 kilometer (1056 miles), self-supported bikepacking race through the mountains of Kyrgyzstan. I’m standing a velvet green valley full of pink-grey granite spikes and a glacial stream running through the middle. Dotted along the valley floor are tiny, soft round yurts with single streams of smoke billowing straight upwards into the bright blue sky. I have stopped here in the warmth of a yurt village filled with familiar faces. I feel horrendous! I’ve always suffered from ambivalence when it comes to this kind of racing. 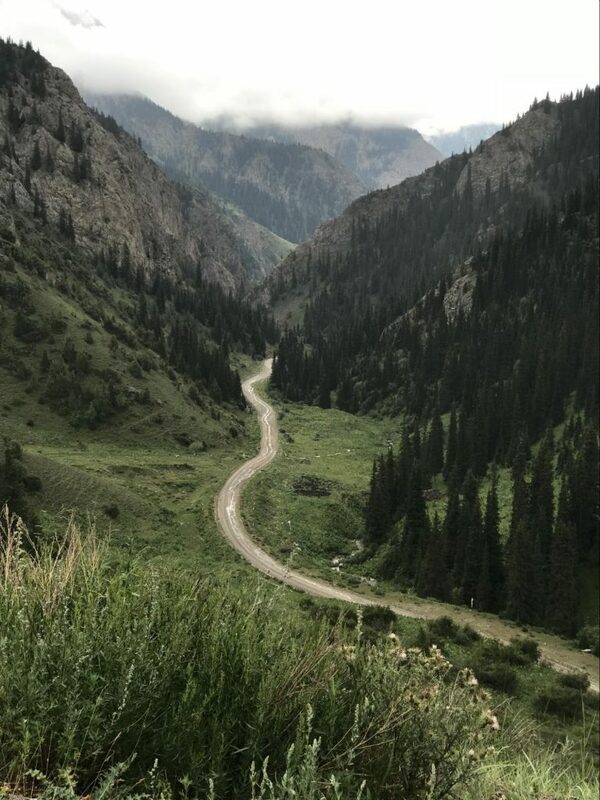 I simultaneously love and hate moving fast through wild places, and so the prospect of my first encounter with the wild landscape and hospitable people of Kyrgyzstan being in a race context filled me with shame. That’s why I decided I would head to Kyrgyzstan a month before the race started, to experience the people and the place at my own pace and on my own agenda first. This was the best and the worst thing I could have done. 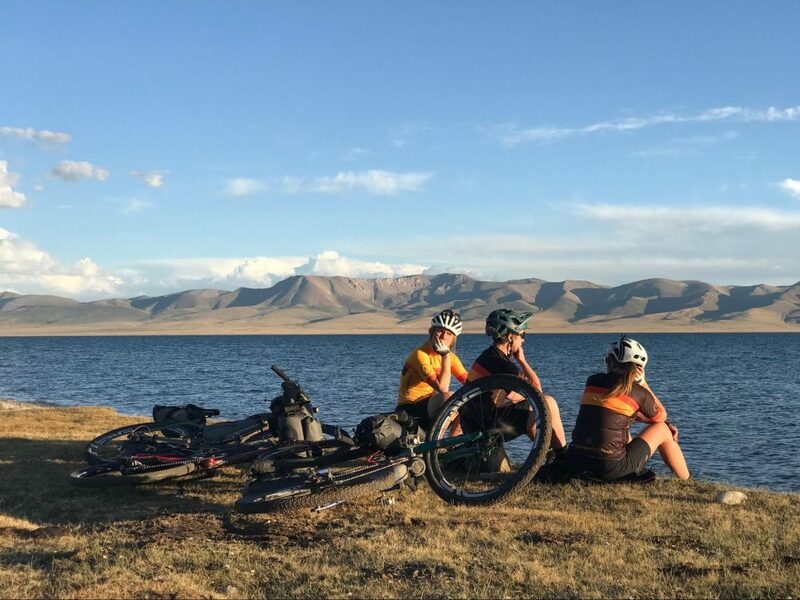 While riding 1400 kilometers (1056 miles) in the weeks before the race, I met some incredible people, slept in some beautiful places, ate some weird food, rode the occasional graceful horse and swam in glacial meltwaters. I also got very sick. 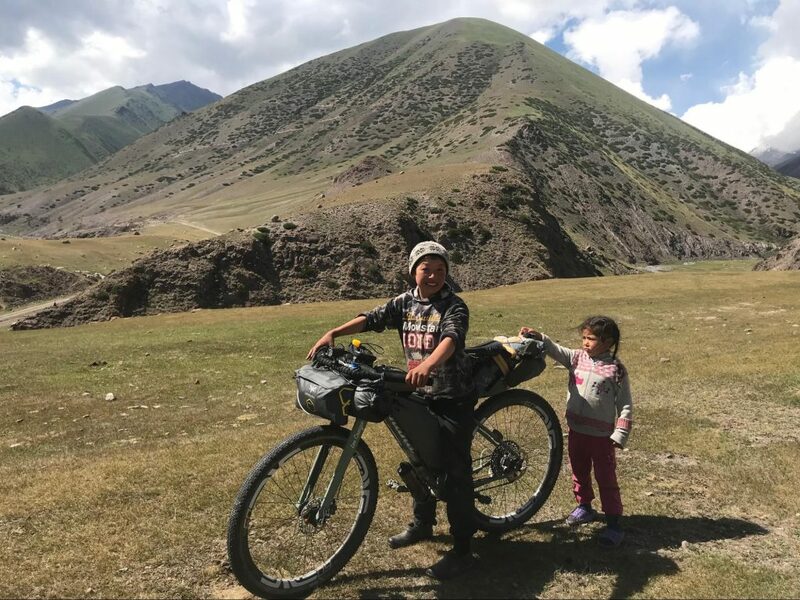 By the time the race started, I was surrounded by 98 other bike racers from around the world in Bishkek — and I was a stone (6 kg) lighter than my usual healthy weight. Already exhausted, I rolled out of the city on August 18th to begin what was to become one of the hardest bike battles I’ve ever endured. Now here we are: It’s day four of the race and I’ve come off route because everything has gone dark in my mind and I can’t keep the pedals turning. How can I describe what just happened? Last night, I passed through the most impressive of desert canyon landscapes. The moon helped me make out the forms of the huge sandstone cliffs I was riding alongside. The air was warm and my tires were giving off pungent explosions of sage as I toiled upwards through the dry valley floor. It was beautiful. I could see that with my eyes. My skin told me it was warm and my nostrils picked up that scent but I couldn’t feel anything. The following day was the same only in the daylight the white light and vastness of the landscape felt intimidating and hostile. I felt like I imagine an astronaut might as they dangle attached to a tiny lifeline in open space. My mind had closed. Everything felt like a battle. When I compete in such races, it’s always hard. But I get as much back from it as I give. Knowing this is what drives me ever onward, but for the last three days, I’ve felt like I was trying to shove myself into the wrong shaped hole. I’m dehydrated and exhausted from being unable to keep anything in my body long enough to extract the nutrients while I need to ride for 20 hours a day. Having melted my sleeping mat on night one, fumbling with my stove using my freezing numb hands, sleeping has been an issue too. This morning I was comfortably sitting in fourth place with everything to play for. But this afternoon, when I hit that road that led to the Chinese border and saw the perfect tarmac stretching to infinity with the heat of the sun wobbling above it, I instinctively turned the other way. I needed something else. I needed to do my own thing. 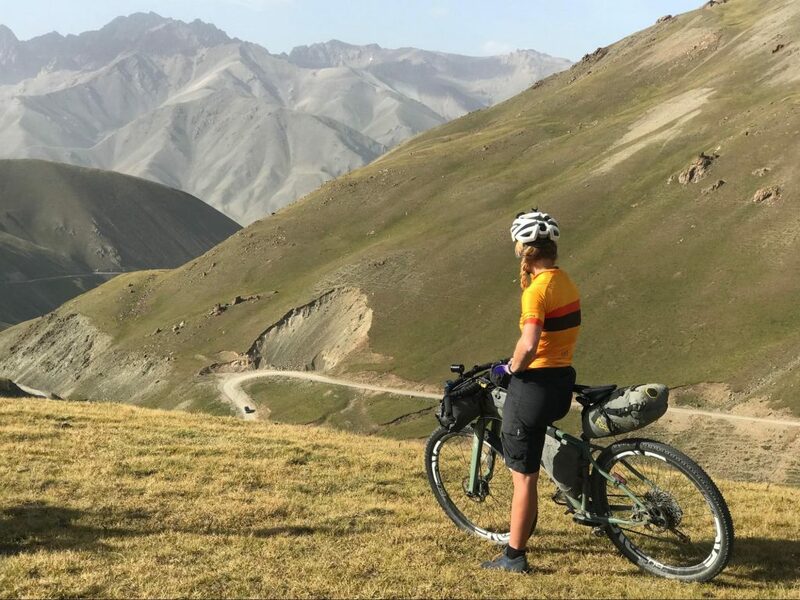 Not disciplined enough to remain on the race route and continue to race, I have left the purple line on my GPS and ridden to Tash Rabat, a 14th-century trading post on the Silk Road. I’ve left my bike and shuffled up the valley to explore the incredible, sprawling stone monument set deep into a spectacular hillside. I’m sitting on its roof which is the size of a football pitch and thinking about all the travelers throughout the centuries who have sought sanctuary here. Fitting, don’t you think? Riding my bike has always been about chasing the joy to be found in exploring the unknown. I’ve always loved getting a bit lost and finding my own way — even when it means carrying or pushing all day. In these moments, I never fail to discover something new and I suppose I’m a little addicted to the feeling of having emerged triumphant from something I wasn’t sure would work out. 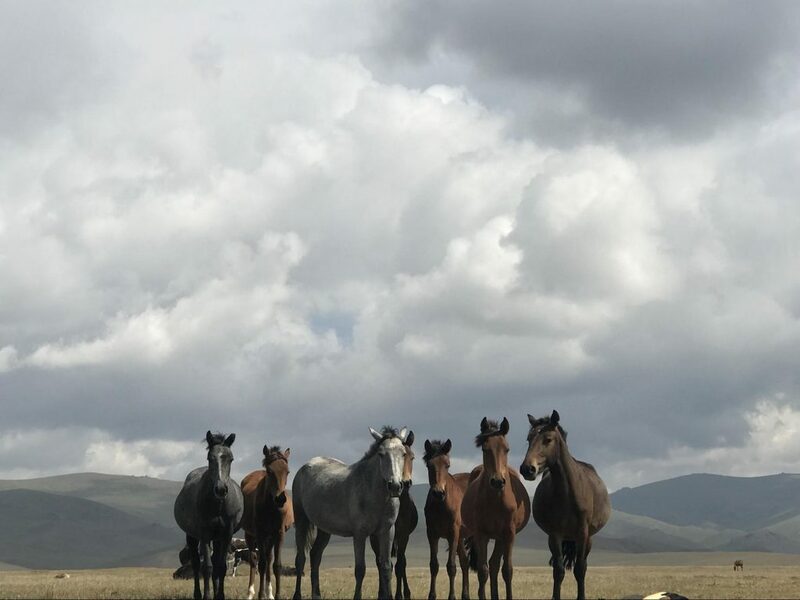 In following that GPS track round a known route in Kyrgyzstan with my race blinkers and a churning stomach, I felt like I was keeping any joy I might feel firmly at bay. After a brief battle with my ego, I decided that this was just not my time and that I should let the race go. I reminded myself that to hold on too tightly to any assumed outcome always ends in disappointment. I was sorry and relieved in equal measure, but ultimately I had to do what my heart was telling me. Now completely off route and miles from the road, I was perfectly placed to have my own adventure. 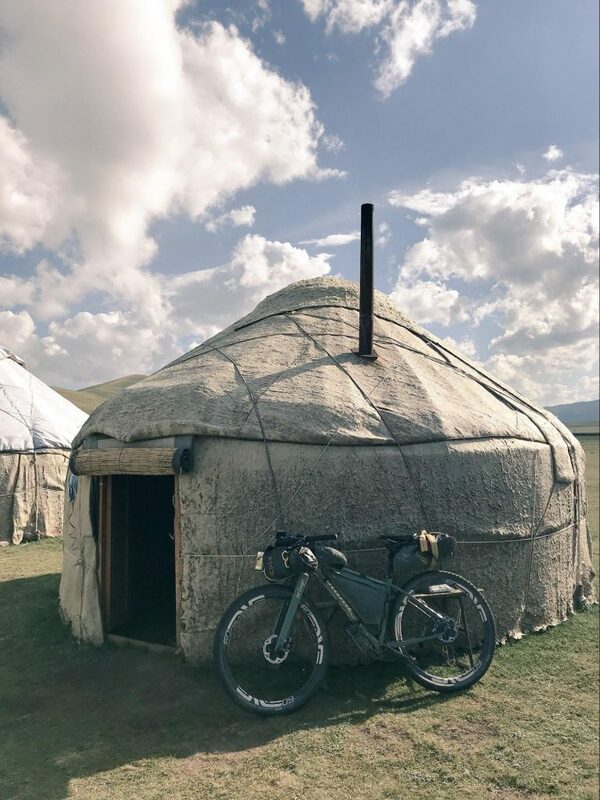 No one in the yurt encampment could tell me if it was possible to ride over Tash Rabat Pass (3960 meters/13,000 feet) and down the other side but with komoot on my phone, I felt I had enough information to give it a go. I set out slowly up the pass, pushing and carrying my bike then riding or running down the other side. In this unexplored little patch of the mountain range, while skittering about on narrow horse track or on no track at all, I found the beginnings of joy returning. Once safely on the other side of the enormous mountain range, I also found that I was committed to continuing on the race route. Without a sleeping mat and with 200 kilometers (124 miles) of cold high desert ahead of me I had to get to checkpoint two that night or it was going to get very uncomfortable indeed. I struck out across the 12 miles of pathless desert that lay between me and the original route east while storm clouds amassed overhead. And this is when the magic returned. Believe me when I say that on this desolate plain there was nothing other than mud cracked earth and tufts of stiff yellow grass. Yet, on this random desert traverse in the vague direction of the gravel road that would eventually lead me to the checkpoint, I encountered two yurts at exactly the same time as the heavens opened. Both times I was invited in, and I sat warm and dry listening to the rain pound off the yurt felt and breathing in the comforting smell of damp wool and wood smoke. My hosts smiled — toothless and wordless — and continually topped up my cup with chai or fermented horse milk until the sun came out again. It was these two encounters that gave me the strength to reach checkpoint two and receive the medical care and rest I so desperately needed. It wasn’t an easy ride, but I made it and then dissolved in a heap and stayed still for two whole days. My body wretched and heaved and shook for 48 hours as I rested in one of the yurts. I was aware of other riders coming and going as my body purged poison but by the time my friend Phillipa arrived at the checkpoint on day six of the race, I was ready to slowly ride my bike again. Together we set off to ride the remainder of the route our own way, scooping up Rickie Cotter along the way and turning the remaining miles into a mutually supportive adventure. We stopped at lunchtimes, put up our tents and made tea while chattering nonsense and sharing food. I would relapse occasionally and need to lie down or be sick but the company of my friends kept the whole thing from feeling like an ordeal. In fact, it was exactly what I needed; moving together in good humor through a wild, beautiful place governed by nothing other than our own rules and care for each other.